drooz doodles: Christmas tree..."TAKE TWO"
oh my goodness. we put our tree up a bit early i guess -Thanksgiving weekend... but that's when we usually do.. and so far so good. not the case this year! 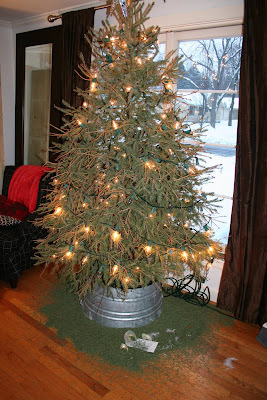 my husband & son chose an adorable tree, cut it down fresh and brought it home. i'm not too sure what was going on .. but it was dropping needles almost immediately! 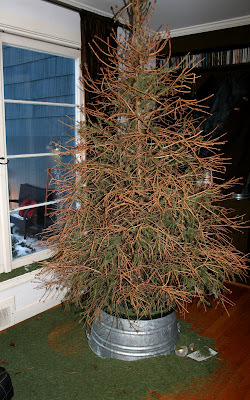 the living room sounded like a giant rain stick - every time someone walked by, closed the front door, or God forbid, sat on the couch - the tree would "rain" it's needles... "please.. no sudden or quick movement around the tree! i thought it would survive at least until Christmas day - but yesterday the ornaments started to s-l-i-d-e right off. OK.. this is NOT good! Time for "Christmas tree...TAKE TWO"!! I've always wanted a fake white Christmas tree. 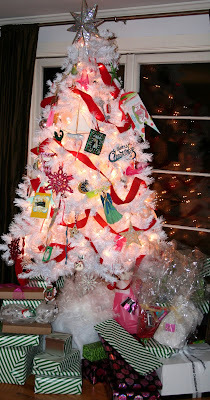 it might just be the artist in me ...a big, white tree is like a giant 3d canvas just awaiting pops of color and cheer! so.. i did it! i went and purchased a super cheap white tree (we WILL be attempting FRESH again next Christmas!) took all the ornaments off, the lights off, and swept up needles for hours and TA-DA! 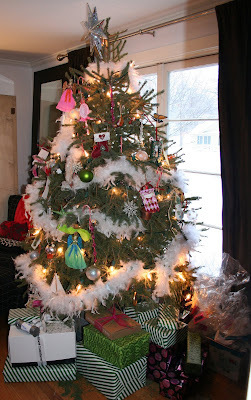 a most festive, fake, colorful and non-shedding tree! -and I LOVE it! 1. droopy, sad, dead real tree. 2. no, that's not a green tree skrit! 3. taking the lights off really did her IN! 4. ta-da! there we GO! aaaa. that's better! I'm reading: Christmas tree..."TAKE TWO"Tweet this! OMGOSH Shellyyyy I LOVE IT!!! Reminds me of my tree growing up...except for having it up in the middle of a playpen so my little brother and poodle couldn't get at it! You did it! GOOD FOR YOU!!!! WOW about that other tree...what the heck??! that's the funniest freakin thing i've seen in awhile...oh my...the second to last photo...without the lights...that's worse than a charlie brown tree...that's just too funny! good for you! much better! Gorgeous! 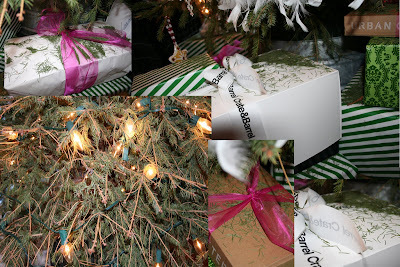 Next year, you should do what my Mom did when I was a kid--have TWO trees!!!! Your real one in one room and the whimsical white one in another. My aunt has a white one that she puts green and blue lights on with silver ornaments and it's pretty spectacular. The same thing happened to us one year! Crazy! Ours was pretty good until a few days after Christmas and then everytime someon walked by, it was tinkling! LOL! I like your new tree though, so perhaps it was a good thing!